Privacy fences are often an essential feature of the urban or suburban yard, and they may even play a role in some rural landscapes. They work in both directions. Firstly, they screen out unpleasant external sights and sounds that would otherwise impinge upon the senses. Secondly, they screen your movements from the prying eyes of neighbors. Learn about fence materials if you want a solid structure; the present article is about looser structures composed of living materials. It is not a question of needing to "hide" anything behind privacy fences (although that may be necessary if you have bad neighbors). It's just that few of us want to live under a microscope. Even good neighbors don't enjoy feeling obligated to wave "Hello" every time they step outside, as if needing permission before continuing on their business. "Good fences make good neighbors" is an old adage made famous by Robert Frost's poem, Mending Wall (regardless of the different interpretations of that poem). And whether referring to boundary lines or privacy fences, it is just as valid today as ever. Speedy results: using wooden privacy fences or PVC vinyl fences for privacy, or masonry walls furnishes instant screening. In contrast, you will have to wait for plants to grow high enough to provide privacy (assuming you are unwilling to pay through the nose for fully-grown plants). Yard maintenance: well-built privacy fences or walls will rarely need to be tended to. Plants, on the other hand, need to be watered, weeded, etc. Their beauty in terms of color, form, and texture. Seasonal variation in some cases, ranging from spring flowers to autumn foliage. Fruit production in some cases, which can attract birds or even be edible for humans. The shape of some shrubs can be controlled by pruning, effectively rendering them works of art (hedges). Zoning restrictions don't apply to living screens as frequently as to hardscape walls. Now let's take a closer look at using living privacy fences. For, once you've decided to use plants (rather than hardscape) to gain a more private setting in the yard, a number of other decisions need to be made. Ideas for Creating "Living Walls"
You've decided on a "living wall" of plants as your preference in privacy screens. But which plants? A candidate for privacy screens that immediately comes to mind is shrubs, but you are by no means restricted to shrubs. If you do choose shrubs, you must further decide between shrubs that do well as hedges, versus shrubs that can be left alone, to assume their own, predestined form in what I will refer to as a "loose border" (also commonly called "mixed shrub borders"). Hedges are a good choice for privacy screens in small-yard landscaping, where space is limited. If the right choice in shrubs is made, and the proper trimming regimen followed, a hedge can be as precisely dimensioned a barrier as any masonry wall. It is in the hedge that the somewhat fanciful phraseology "living wall" finds its best justification. The trade-off, of course, is in the added maintenance. The amount of sun the area gets is also a consideration. Yews (Taxus x media) will tolerate some shade, but they do require good drainage. Choosing plants for privacy screens, however, doesn't necessarily entail growing a hedge—or sticking exclusively with shrubs, for that matter. The "loose border" is an alternative to hedges. While hedges are usually homogeneous, a loose border can be composed of different kinds of evergreen shrubs, as well as deciduous shrubs. If you are not limited for space, chances are you will find a loose border of shrubs, mixed with other plants, more to your liking than the formal austerity of hedges. In planning for a loose border, select shrubs that will attain the desired height and width. 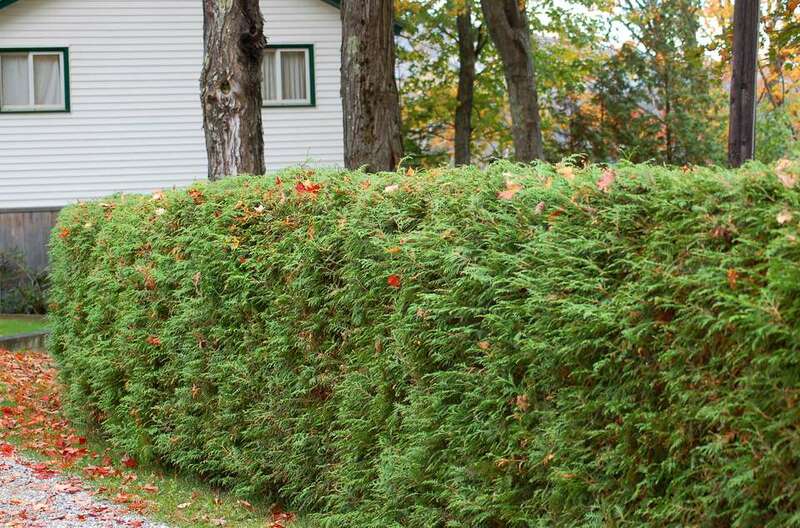 To act as effective privacy screens, shrubs with dense growth habits have obvious advantages. Part of the attraction of the loose border alternative is low-maintenance. You are thus defeating the purpose if you plant shrubs that will outgrow the bounds intended for privacy screens, forcing you to get out there with the pruning shears and restore order. Place plants of the same type in odd-numbered groups: three of this over here, three of that over there, for instance. Even-numbered groups suggest an attempt at a symmetrical landscape design that is out of keeping with the "loose border" look. Use repetition to "tie-in" areas of the border. If, for instance, you planted a group of three delphiniums in one portion of your middle row, repeat (with the same color delphinium) somewhere else in that row. The height of privacy screens is, of course, a primary consideration. So we will look at specific shrub choices for privacy screens below, including their projected heights at maturity. But before finalizing your plan for planting a privacy screen—whether it be a hedge or a loose border—there are some other factors to consider. One factor in shrub selection to consider, in addition to height, is the amount of sun this part of your yard gets. Sunlight requirements for flowering bushes can be hard to meet if you have a lot of shade. As mentioned earlier, yews will tolerate some shade, as will Canadian hemlock trees (Tsuga canadensis), andromeda shrubs (Pieris japonica), azaleas and rhododendrons and viburnums. But you will certainly have more options if the area you've chosen for building a living privacy fence is sunny, and this article focuses on shrubs intended for areas receiving at least 6 hours of sun per day. Most flowering bushes require this much sun. The form of the shrub. The texture of the shrub's foliage or bark. The color provided by the shrub, be it through the foliage, the fruit, or—with flowering bushes—the blooms. Blackhaw viburnum is a deciduous shrub whose scientific plant name is Viburnum prunifolium. Its white flowers in May turn into edible and attractive fruits by fall. Its fall foliage color is purplish to bronzy-red or crimson. Reaching a maximum height of about 15 feet, the shrub is a bit taller than it is wide (maximum width of about 12 feet). Grow blackhaw viburnums in planting zones 3-9. Rose of Sharon (Hibiscus syriacus) is a medium-sized flowering shrub, also known as shrub Althea, that can reach a height of 8-10 feet with a spread of 4-6 feet. These bushes profit from pruning. Blooms can be red, pink, blue, purple, or white. Rose of sharon works well in shrub borders, because of its upright form. A row of these shrubs standing shoulder-to-shoulder forms a colorful privacy screen. Zones 5-9. For more information, please consult my plant profile on rose of sharon. Viburnum trilobum 'Compactum' branches in a dense pattern. You won't have to prune compact American cranberrybush viburnum very much, which is why it's suitable for low-care loose borders. This 4-foot x 4 foot rounded shrub blooms in late spring. Its white blossoms transition into red fruits by autumn. Wild birds eat the berries. Its glossy leaves are green in summer; in autumn they become purplish or red. Very cold-tolerant, it reputedly can be grown as far north as zone 2. There is a good reason for the inclusion of two viburnums here. Viburnum flowering bushes provide year-round interest. Their spring profusion of white to pink flowers give way in summer to large leaves that often exhibit an intricate texture. Red to purple foliage and colorful berries adorn the fall landscape, while a dramatic branching structure provides visual interest during the winter. One of the best in terms of a visual flower display is doublefile viburnum, while Korean spice viburnum will be favored by those who crave fragrance. Evergreen shrubs, with their year-round foliage displays, are, of course, prime candidates for privacy screens. Arborvitae, juniper, and holly will be considered below, as examples of tall, medium and small evergreen shrubs suitable for privacy screens. "Emerald" arborvitae (Thuja occidentalis 'Emerald') is a small tree or tall evergreen shrub well-suited for the "loose border" style of living privacy fence that we have been discussing. With its flat, long-lasting needles and dense growth-habit, just let this evergreen shrub grow into the tall living wall that you need—with little maintenance on your part. Narrow and upright in form, Emerald arborvitae attains a height of 15-20 feet, with a spread of about 4 feet. A shorter arborvitae choice than Emerald is 'North Pole.' Or if you want to go with something totally different, try Irish juniper. These junipers (called Juniperus communis 'Stricta' in botanical lingo) are favorite evergreen shrubs of mine for privacy screens. With a dense growth-habit and narrow, columnar form, just let them stand together in a colonnade to form a loose border, walling out unwanted sights, sounds, and overly-curious neighbors. Irish juniper has a wonderful bluish-green color and grows to 10-12 feet in height. These evergreen shrubs are so narrow in width as to resemble a column. Hardy to zone 3. "Little Red" holly (Ilex x 'Little Red') has a dense growth-habit and compact nature (5 feet x 5 feet) that make it useful for privacy hedges in areas where taller privacy screens are not desirable. These evergreen shrubs produce attractive red berries and have a moderate growth rate. Little Red holly can be grown in full sun or partial shade. Like American holly, it likes well-drained earth with a soil pH that is acidic. Cold hardy to zone 6. As broadleaf evergreen shrubs, hollies make ideal screens around pools—no leaves or needles to clean up. Little Red holly responds well to pruning, meaning that you can sculpt a beautiful, formal hedge out of it. In choosing privacy screens, remember that hardscape and softscape needn't be mutually exclusive. Hardscape privacy fencing that you find unattractive or in need of "dressing" may be adorned with vines. For more on the myriad landscaping uses for vines, please consult "Landscaping With Vines." Climbing roses, like vines, can also be used for this purpose. To grow some lovely "clothing" for your fencing, learn the tricks for growing roses. Finally, there are common plants having the potential for use in living privacy fences that you may easily overlook, but that nosy neighbor will not be able to look over. Eastern hemlocks (Tsuga canadenesis) are best known as forest trees that reach enormous heights (60 feet or more). But if you select a shrub-form cultivar, eastern hemlocks can be maintained at the height you desire. A properly pruned row of these evergreen shrubs can form a dense and attractive hedge, with their feathery foliage. Likewise, eastern white pine (Pinus strobus) grows to a height of 100 feet or more in the forest, but that doesn't mean that, with pruning, it can't be shaped into a well-behaved evergreen shrub. You may already have a crop of young pines on your property, just begging to be transplanted into a row and pruned into a neat evergreen hedge—a free-living privacy fence.